The Malabrigo yarn mill caught fiber! 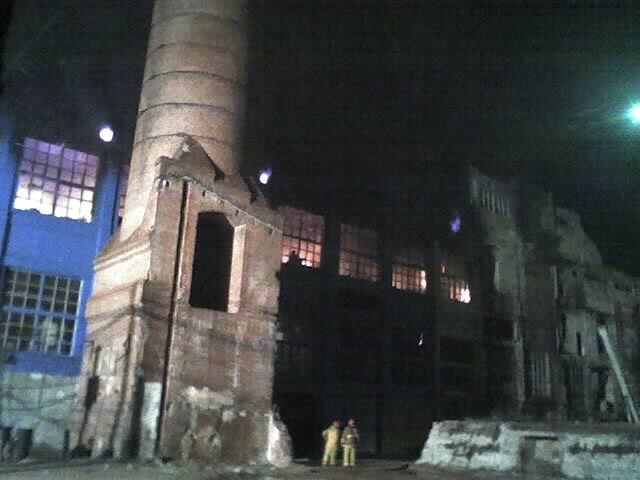 Luckily, no one got hurt so we can semi-joke about it being a major fiber tragedy instead of a human tragedy. All that yarn! All those records! I thought my heart was going to stop for a second when I saw the post on Ravelry! So its once again the Relay for Life, and once again its storming and there's a tornado watch. There's storms abrewin' at work too, so I'm just not happy. I was up until nearly 2, so I really was hoping for a calm and pieceful day. Of course, that won't happen when the bosses who were going to go golfing today don't. Then, my addiction reared its ugly head. I saw this when I tried to log onto Ravelry this morning! Its one of those things. I don't log on for a day or two at a time sometimes, but I always know its there. Its like a fiber arts community blanket, that keeps everyone in it warm all the time. Then they take it away to get it washed. And then people go crazy! So I ended up with a bag and part of a box full of stuff to sell at the Relay. I'm hoping to get more done during lunch today. I really just want to go home and go to bed, but obligations arise, I suppose. I'll have some new patterns off of what I did last night - a couple new scarves. And we'll see what I get done between the time I get to Relay, the time it starts, and the time I'm probably going to spend in the car, waiting out the rain. This pattern can now be found on Ravelry! Check out my latest post on the moccasins for more details. 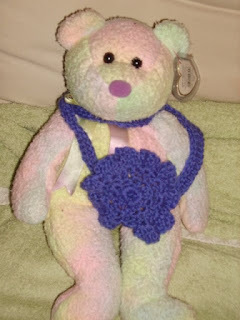 My newest pattern, created just for the Relay for Life of Berwyn Cicero. The Great American Mutt Show was AWESOME! If you're on Ravelry, you've already read of my trials and tribulations with this pattern. The sizing is crazy, the gauge is way off and its written in the most confusing way possible. When the piece measures the same as the back to armhole (aka the place where the marker was on the back piece, not called the same thing here), place a marker on each side. Decrease 1 stitch at the neck edge every row 4 times, and then every other row 3 times. The work it until it measures the same length as the back, and do the funky neck shaping that they've developed. He he... I'm waiting on the boss to come take a look at what I'm affectionately calling the "kitchen sink" powerpoint (as in, "everything but the ...). 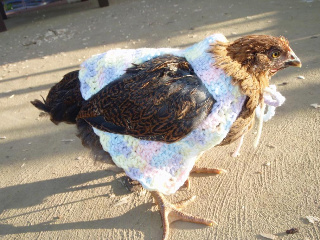 Yes, that's right...its a chicken wearing a sweater. I had a good laugh over it, and then I saw how nice the photos were in the users account. So without further ado, thank Squiddles from Flickr for the lovely chicken sweater (and her photograph thereof) and I highly encourage you to waste some time on this lovely Friday looking at her other excellent photographs. This was posted to the Records Preservation and Community Access Blog yesterday. I HIGHLY ENCOURAGE YOU TO WRITE YOUR REPRESENTATIVE. America is a young country that needs to preserve its history for future generations. What we have gone through in the past may very well repeat itself, and how are future generations to learn? With the downfall of many genealogical and historical societies, without these grants, the remaining ones may not survive. Congressmen Maurice Hinchey (D-NY) and Chris Cannon (R-UT) have issued a “dear colleagues” letter to the members of the House of Representatives, inviting them to sign on as original sponsors to the “Preserving the American Historical Record” (PAHR) bill. PAHR proposed to increase federal support for state and local archival records held by government agencies, historical societies, libraries, and related organizations. This initiative would establish a program of formula-based grants to states for re-grants and statewide services to support preservations and use of historical records. The program, to be administered by the National Archives, will provide a total of $50 million per year nationwide. Each state would receive a portion of these funds for redistribution to organizations within its borders. This program would be in addition to the existing national grants program within the National Historical Publications and Records Commission. Contact your Representative in Congress and urge them to sign on as an original sponsor of PAHR. Write a few sentences telling him or her how PAHR would help his or her constituents — you! (Tell them how vital it is to have records preserved and available to the public.) Also, spread the word about this action alert! Time is critical. Deadline for action is Saturday, May 10. So after ditching two deadlines (stupid work - we'll never grow if we can't give up micromanaging marketing), I found myself today with a bit of free time. So I look a lot like Beyonce, Jesse McCartney, and ... Bob Dylan? That thing is so off. If I use a different photo I get totally different results - a newer one I took and it said I looked like Halle Berry. Yeah right! So I'm sitting here at the computer, working a "tight" deadline supposedly. the guys are supposed to be helping me with stuff, and one's doing a webex, and the other's on a conf call denying reality. I decided to take a fifteen minute break to chill out some. And took a Meyers-Briggs test at the urging of a staffing company email. those of their NFP counterparts. I like that! It very much fits me. I juggle a TON of different things at a time. I would ADORE having my own business, just lack of financials right now is the only thing that prevents me. Their offices may or may not be cluttered, but their conclusions (reached through feelings) about people and motives are drawn much more quickly and are more resilient than those of their NFP counterparts. Resilient. Hehe. My husband more commonly calls it "being stubborn". I make an opinion and then I stick with it, unless it can be proved wrong. And there's only a few people who can prove me wrong - the husband, my good friend Emiel, and my two best girlfriends Amy and Lorraina. Face-to-face relationships are intense, personable and warm, though they may be so infrequently achieved that intimate friendships are rare.